For some time now (around four years) Ed’s been regularly collaborating with web development and coding extraordinaires WebFox. 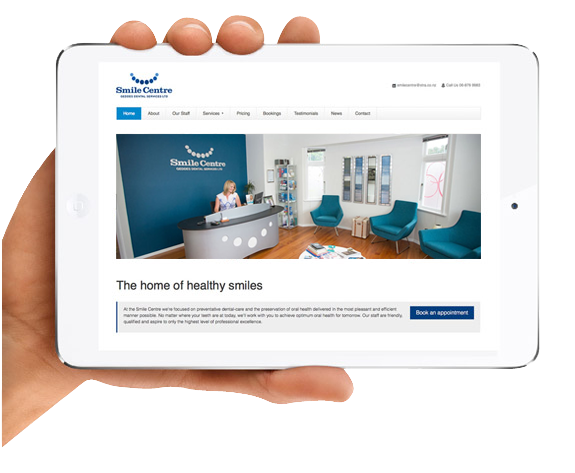 One of the more recent WebFox projects Ed wrote was for The Smile Centre – a revolutionary dental practice offering two unique services with The Healzone and The Wand. The call from WebFox went something like this. “Our client needs copy for their new website. Please call them to sort it. When it’s done, send to us to load and style into the new dev. Thanks, see ya.” The Smile Centre was a newly established business so didn’t have any available collateral, which meant no existing copy to base the writing on. Ed met with the client and went about a series of QnAs in person, on the phone and via email, before a site-map was established along with associated written content. The key was to determine the reasons behind The Smile Centre’s decision to have a website developed, before working up the copywriting to reflect their core goals and objectives. The Healzone is a specialised system to deliver ozone gas onto a client’s tooth to disinfect the surface. It’s used for very deep decayed cavities when the dentist wishes to reduce the chances of drilling close to the nerve of the tooth. Its application takes one minute, is completely safe, and most of all painless. It is followed by an application of calcium, phosphate and fluoride to re-mineralise enamel and dentine. The Wand is a unique local anaesthetic delivery system that reduces the discomfort of injections used to numb teeth and gums prior to dental work. The Wand offers peace-of-mind and much comfort to patients who are apprehensive about dental injections or have a low pain threshold. When Ed works with WebFox it’s always a breeze. And writing the copy for The Smile Centre website was no exception. Many more Ed-WebFox projects will be profiled in future, not to mention the ones still to come. Meanwhile, next time you need a scale and polish or a a cavity filled, put your mind at ease by visiting the team at The Smile Centre.